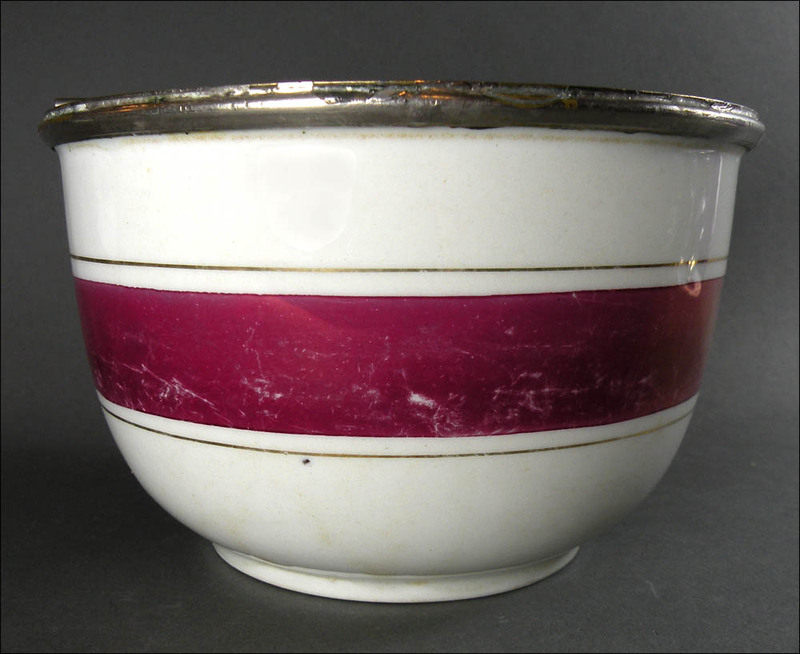 Here’s a very nice, heavy, large flip-top bowl with a broad maroon or burgundy band that’s surrounded on each side with a narrow gold line. It is 5 5/8” wide by 3 ½” high. 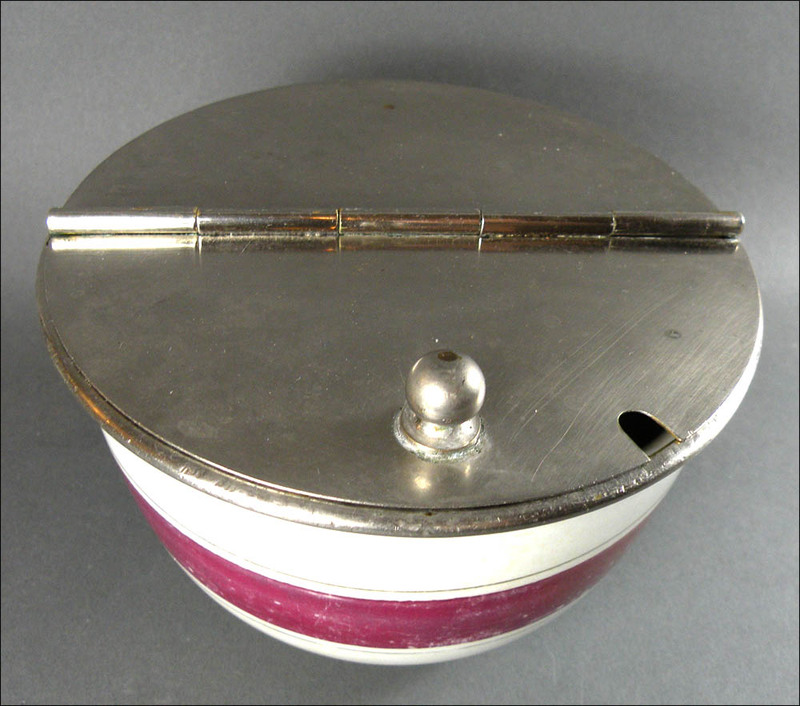 S. Blickman, shown on the backstamp, would have ordered the base from an unknown manufacturer and fabricated the lid. From researching the family’s history, I found that any of their pieces stamped Weehawken would be after their 1923 move from New York to New Jersey, so that would be an accurate early date for this flip. 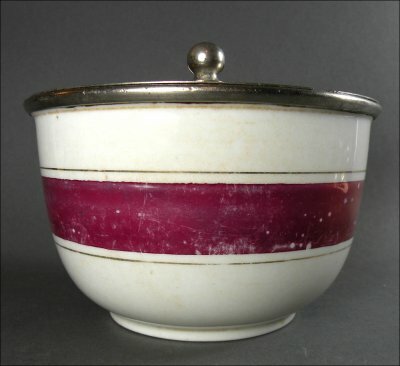 The bowl’s condition is excellent, shiny and with very little visible wear to the stripes. 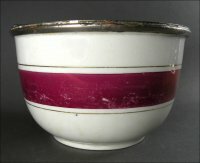 However, as is common with bowls stamped either S. Blickman or a certain group from Utilities Specialties, as I say on my website, the finish is slightly marbled (likely from wear and washing) and definitely has a slightly pearlized sheen or lustre that is unique among flip glazes. The wear suggests that the glaze was relatively low-fire and has not held up as well as many others over time. If you look at the second photo on this page (http://susan-phillips.com/utilities-specialties-2012-china.html), you’ll see that this bowl by comparison is in great condition. I don’t mean to belabor this, but I’m still curious about what company might have made these bowls with this relative delicate glaze. The lid has the myriad of scratches I expect on these bowls, including one small dent across from the knob where the lid was dropped onto it countless times. 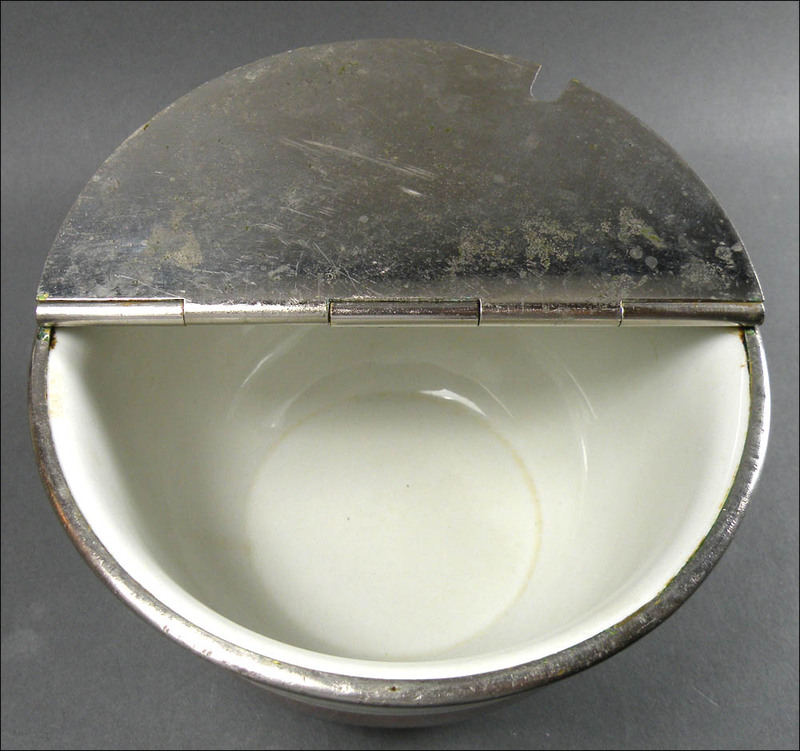 Underneath the lid there appears to be small dots of plating loss. The nice, rounded knob is firmly attached – no wobble. This is a bowl that would be perfect for display or to use multiple times a day for a lifetime and to clean in the dishwasher as often as you wish. They are workhorses!